Hello Everyone: I'm later than usual posting this card but I have my grandchildren spending some time with us so, my house is busier than usual but, I love having them here, they are such a joy. 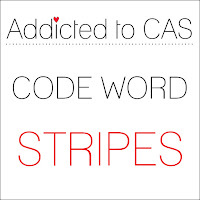 This card I made is for the Addicted to CAS Challenge #92, Code Word STRIPES, here it is. This fabulous Zebra image is from the retired SU set called "Zoo Review" from the 2011-2012 catalog, all of this amazing images of wild animals are just perfect to make masculine cards. This card couldn't have been quicker to make, I just stamped the Zebra with Versafine Onix Black ink and heat embossed it with clear embossing powder, the stripped strip on the left was done with one of the images on the "Gorgeous Grunge" stamp set from the 2013-201 SU catalog, I just used my MISTI to place the stripes where I wanted them and heat embossed them the same way. I added those trees in the background to complete this wild scene. The sentiment is from Power Poppy's "Go Wild" stamp set. I repeated the stripped pattern here, the sentiment is from the same Power Poppy set. Hello everyone: This week at Shopping Our Stash, we have a fun and unique challenge for you. We want you to create a card inspired by your bedding, yes, yes.....whether is the colors, fabric or design, go take a look at your quilts, or bedspreads, comforters, etc. we can't wait to see what you come up with. My card is inspired by my bedspread, which is not really very colorful, I must say. It's pistachio green and gray but it does have some pretty designs on it so, I grabbed that soft pretty green and added some color of my own. Hope you like this card. I just punched a few 1 1/2" squares and arranged them to make this pattern then, I grabbed an old embossing folder from Cuttlebug and, after I glued the squares I ran the whole panel on my Big Shot to create the swirls. The Sentiment, spool and needle, are from a very old stamp set that I have no clue where it came from. Back when I started stamping I had the habit of throwing away the packaging of my sets and dies without saving that information but, in my defense, I never thought I was going to need it someday, a blog was the last thing on my mind. I just stamped this spool and the needle onto some scraps of Strathmore 90lb. water color paper because I was going to fussy cut them. Yes, I even fussy cut this needle. I wrapped some real embroidery thread on the spool and cut a small piece to "thread" it through the needle. Well, I didn't really actually thread it, I just made a small slit on the "eye" with an exacto knife and place the thread in it and added a little drop of glue to keep it in place and a couple more for that thread to stay on the panel. The sentiment, quilt blocks and needle image are also from this set. I hope you guys give this challenge a try, there is a lot of possibilities with it, take the colors or the design of your bedding, pillows, etc. make a card and share it with us in the gallery. Don't forget to stop by my teammates blogs to see their awesome cards and get more inspiration and leave them some crafty love.